The What: MuxLab has begun shipping its HDMI 4x1 Switcher with Audio Extraction, 4K/60 (model 500437). It features four sources that can be independently switched and viewed on the same display with support for 12-bit Deep Color and 3D viewing. The What Else: For high-performance installations, this switcher extracts digital audio from each source, and outputs it as S/PDIF Toslink or two-channel audio. Specifically, it extracts LPCM 2.0 or 5.1, Dolby 5.1, and DTS 5.1 audio and delivers it as digital S/PDIF Toslink. LPCM 2.0 audio can be extracted and delivered as analog two-channel audio using standard RCA jacks. The switcher also supports HDMI pass-through of all digital audio modes including LPCM 7.1, Dolby TrueHD, Dolby Digital Plus, Dolby Atmos, DTS-HD Master Audio, and DTS:X. 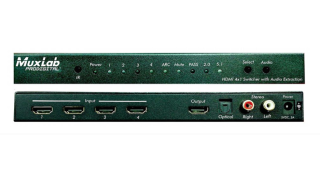 Users have the option of selecting between four HDMI inputs, and three audio modes of pass-through, 2.0 and 5.1 audio using the switcher’s front-panel buttons or the IR remote control. The switcher’s audio return channel sends selected audio back to the source. Additional audio equipment can then be connected to amplify surround sound and higher-level audio in the viewing environment. The Bottom Line: The HDMI 4x1 Switcher offers higher resolution support, up to 4K60 (4:4:4), and supports the integration of four sources using the same display. The rugged enclosure provides all connectors on the rear panel for a tidy installation.